Once upon a time Birr, Co.Offaly didn’t exist. There was a town there all right, but it was called Parsonstown, King’s County. The ‘Parson’ in question wasn’t a cleric. The name derived from the Parsons family [plural], who were local landowners bearing the hereditary title of Earls of Rosse. The most prominent of that name was the 3rd Earl, William Parsons, born in 1800 during the debate on the Act of Union, a piece of legislation his father vigorously opposed. As the humble Lord Oxmantown William Parsons been educated at Trinity College, Dublin and Magdalen College, Oxford, where he graduated with a first in mathematics in 1822. He inherited his father’s title in 1841. Prior to that he had been an MP who had voted both for Catholic Emancipation and the Great Reform Bill of 1832. The facility with sums proved to be useful in his future obsession. Because William Parsons was an astronomer. 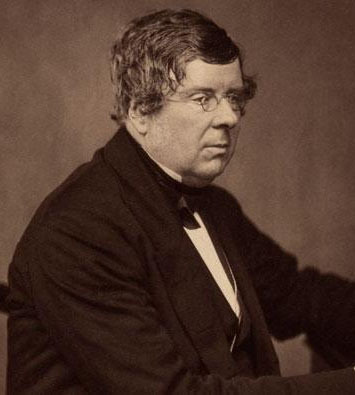 Not just someone who liked to look at the stars through whatever enhancing lens was available, but a serious scientist who won the Royal Medal in 1851. Previous winners included Humphry Davy, John Hesrchel (three times), Michael Faraday (twice) and our own William Rowan Hamilton. It was a sort of Victorian Nobel Prize. Once he inherited the title Earl of Rosse and came into possession of Birr Castle he could do pretty much whatever he liked with the ancestral pile. So he proceeded to move in the biggest telescope ever built – the 72” Leviathan, built to his own specifications. It would continue to be the world’s largest telescope, in terms of aperture size, until the early years of the 20th century. Work on this wonder of modern science and technology began in 1842 and it was completed by 1845. 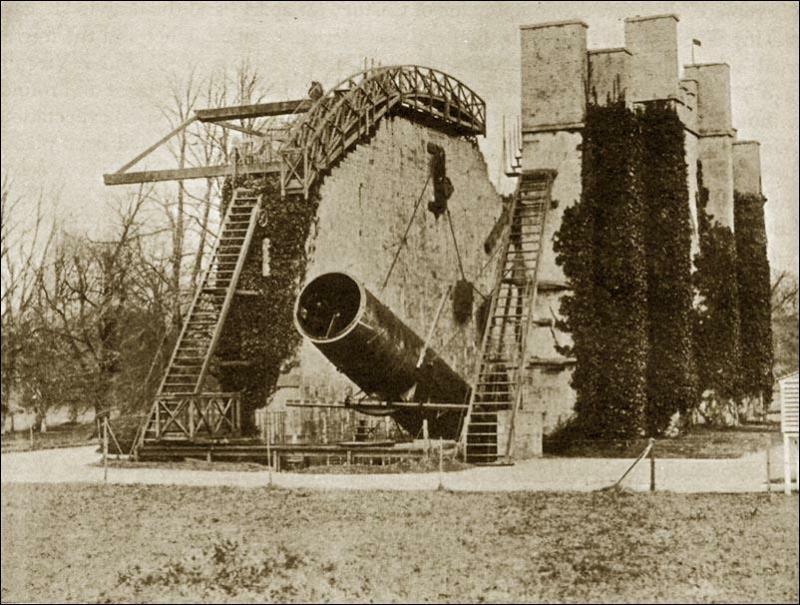 It was constructed largely through trial and error as few telescope makers had left behind the secrets of their trade and Lord Rosse started out on his labours a century and a half before Google. The Leviathan was revealed to the world in a whimsical ceremony. By way of dedication, blessing or opening a Church of Ireland Dean walked through the length of the telescope’s six-foot wide tube wearing a top hat and with an umbrella raised above his head, presumably because he could. No sooner was the Leviathan complete than it was rendered inactive by the calamity of Great Famine. William Parsons devoted much of his family fortune and most of his time for the next three years to alleviating the effects of famine in what would later become Birr, Co.Offaly. When Rosse did get the Leviathan up and running again his concentration was on the distant nebulae, whose spiral structure he identified thanks to his powerful telescope. He theorised, based on his observations, that millions of galaxies, like our own, might exist. His conclusions were later borne out when the era of radio-astronomy dawned and his deductions could be verified. Astronomers from all over the world would come to Birr Castle to use Leviathan themselves. Rosse was far from precious when it came sharing his impressive telescope. His own findings and theories were published in the proceedings of the Royal Irish Academy and the Royal Astronomical Society. Recognition followed swiftly. Rosse became a Knight of the Order of St.Patrick in 1845 and was awarded the French Legion of Honour in 1855. Rosse’s health began to fail in the 1860s and he took a house near the sea at Monkstown near Dublin to assist in his recuperation. He died there 147 years ago, on this day. This entry was posted in Uncategorized and tagged Birr Castle, Earl of Rosse, Great Famine, Leviathan, Parsonstown. Bookmark the permalink.